Hydrogenation with Low-Cost Transition Metals describes recent developments in the preparation of catalysts and their catalytic abilities in chemoselective hydrogenation for the production of fine chemicals and pharmaceutical compounds. Emphasizing the use of low-cost metals (Cu, Ni, Fe, and Ag) that are often present in the form of nanoparticles, the book provides valuable reaction mechanism schemes, engineering solutions, and perspective for the field. Jacinto Sá is the Nanoleaves and Heterogeneous Catalysis Group leader at Uppsala University, Sweden, and the Modern Heterogeneous Catalysis Group leader at the Institute of Physical Chemistry, Polish Academy of Sciences, Warsaw. He received his M.Sc from the Universidade de Aveiro, Portugal, and his Ph.D from the University of Aberdeen, Scotland. Currently, Dr. Sá’s research is focused on understanding the elemental steps of catalysis, particularly in artificial photosynthesis and nanocatalytic systems used in the production of fine and pharmaceutical chemicals. Widely published and respected, Dr. Sá received an R&D 100 Award for his work with the CenTACat Group, Queen’s University Belfast, Northern Ireland. Anna Srebowata is a Modern Heterogeneous Catalysis Group member at the Institute of Physical Chemistry, Polish Academy of Sciences, Warsaw, and a member of the Polish Chemical Society and the Polish Club of Catalysis. She received her M.Sc from Jan Kochanowski University, Kielce, Poland, and Ph.D from the Institute of Physical Chemistry, Polish Academy of Sciences. Currently, Dr. Srebowata’s research is focused on the application of modern nanomaterials based on transition metals as catalysts for environmental protection. The aim of her study is catalytic conversion of chloroorganic compounds into value-added products. Previously, she was vice coordinator of GDRI Catalyse PAN—CNRS. "This book provides a broad overview of hydrogenation reactions catalyzed by inexpensive metals. It is timely, because the importance of developing catalysts that do not require large quantities of rare and expensive metals is increasingly recognized as being a critical sustainability issue for catalysis. Using case studies from the recent scientific literature, the authors focus on how catalysts that utilize nickel, iron, copper, and silver can be applied to reactions of practical interest in fine chemicals, pharmaceuticals, conversion of biomass to bioproducts, and other areas. 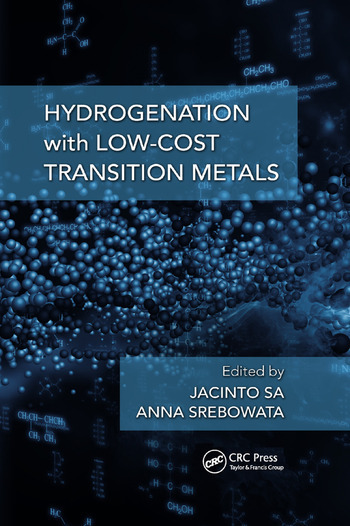 This book can therefore provide an important foundation for students and researchers interested in hydrogenation catalysis." "In a context where noble metals are subject to higher and fluctuating costs, this book presents an interesting overview on the performance of heterogeneous catalysts based on cheaper and more abundant metals, such as iron, nickel, or copper, as substitutes for selective hydrogenation reactions in fine chemistry (drugs syntheses, processing of biosourced molecules) and depollution through bibliographical reports based on the most recent literature. A pertinent emphasis is put on the current knowledge concerning support and particle size effects, which are still open questions that need to be answered in the future to optimize the catalysts’ properties." "The book clearly presents important problems in the field of chemical catalysis. Search for new, cheaper, and effective catalysts for hydrogenation processes is essential for the development of chemical technology, particularly in relation to technology of fine chemicals." "Hydrogenation reactions are ubiquitous in the processing of feedstock for fuels, food, and fine chemical applications. The need to develop more cost-effective and less toxic formulations and processes is obvious, and this book depicts in a didactic manner recent achievements and current challenges in the use of base metals."